Keep the blinds and windows closed during the day, reducing the effects of radiant heat, and open at night. Set your air conditioner higher. By using a smart thermostat, you can easily adjust temperatures for when you are away from home. Minimize indoor heat. Avoid using major appliances during the heat of the day – limit cooking, doing laundry and taking showers in the heat of the day. Avoid turning on lights during the day. This creates unnecessary heat. Switch from incandescent bulbs to energy-saving CFL or LED light bulbs. Wash clothes using a cold water cycle and make sure to clean out the lint filter in your clothes dryer after every use. Use ceiling fans along with your air conditioning system. “If you use air conditioning, a ceiling fan will allow you to raise the thermostat setting about 4°F with no reduction in comfort,” according to Energy.gov. 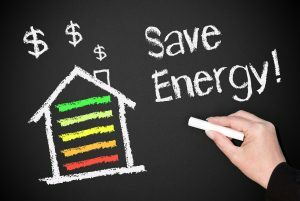 These tips can help you save energy and money this season, all while still keeping you comfortable. If your A/C does need repaired, call us or schedule your next service call online today!